Can I have 2 inputs with only one output,that I can switch between the 2 inputs if I want too? Yes that’s how I’m using it to cctv system . What kind of additional latency could I expect when adding this into my connections? BEST ANSWER: I didn't see any latency with mine. I use it to run a two screen set-up for lectures. I run one input from laptop split out to two projectors. One is connected via a 15 ft HDMI and the second runs to an HDMI over CAT5 extension (about 50'). Giving that most of what I am viewing is power point presentations, it's hard to say if there is any time issue. it's a nice unit especially for the price. Access time is excellent, in my opinion there is no detectable delay. Also, there is absolutely no signal loss. Happy with this product. Anyone able to control this box with a Harmony remote? BEST ANSWER: I was able to program this with a generic universal remote via ir programming. So, I do not see why the harmony would not work. I'd like to use this to take video from a 1080p source and a 4k source, and display it on a TV and a monitor, one of which is 1080p, and one of which is 4k. What will happen when I try to display the 4k input on the 4k TV and 1080p monitor at once? BEST ANSWER: Hello, this Matrix will use the lowest common denominator which is 1080p and will output and input at 1080p for all devices. I hope this helps and take you for your question! If I have one 1080p display and one 4K display hooked up to this with a 4K source. (I understand that the 4K source will display 1080p on both displays at the same time.) Would the 4K TV receive 4K resolution if the 1080p TV is turned off? I have DirecTV. I typically watch TV using the TV's speakers (Pioneer Kuro), but sometimes want to use AVR and "big speakers". Hopefully I can input the DirecTV receiver and output to either the TV for normal viewing or to the AVR when I need a bigger sound. 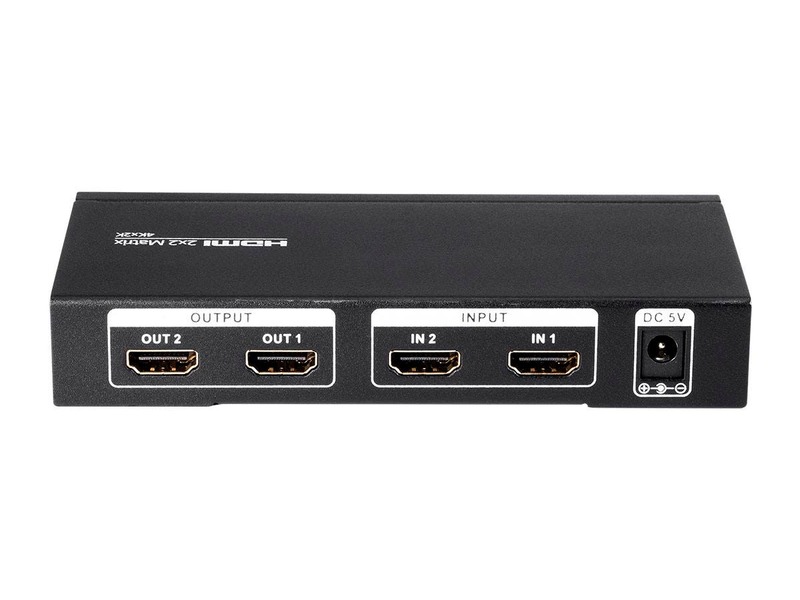 I have purchased a couple of HDMI splitters that did not work for this application. I understand that a switch is the answer. What do you think? BEST ANSWER: Hello, thank you for your question. 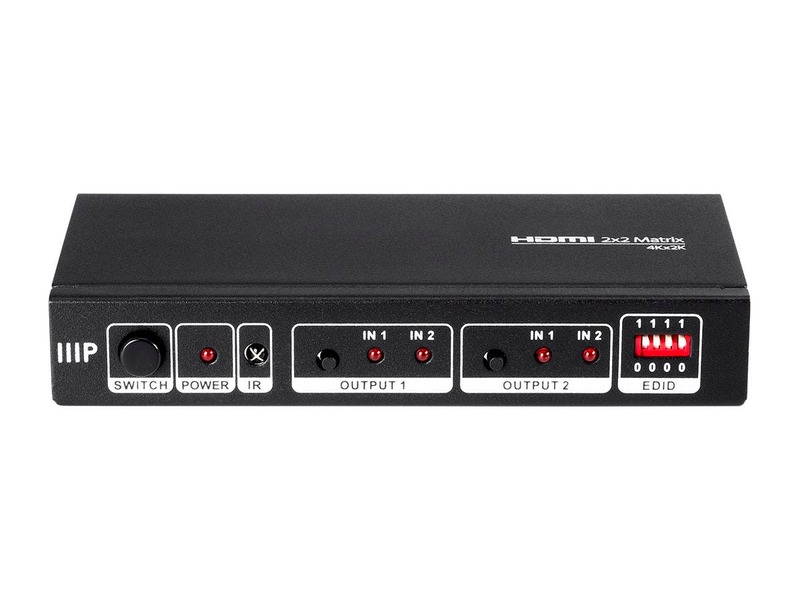 While a switch like this matrix will definitely offer the solution you are looking for, we would recommend getting a unit that has HDCP support such as product # 15258 as cable/satellite boxes tend to already have issues with HDCP handshakes when it comes to interrupting the signal and this will give your setup the best possible chance at working correctly. BEST ANSWER: Well the 1.4 gives you 1 in & 4 outputs and the 2.2 gives you 2 in & 2 outputs. So if you have a need to connect 2 sources to 2 different components or displays with auto switching the matrix is the way to go. If you only have 1 source you want to send out to 4 different components or displays the 1.4 would be the way to go. Perhaps the question was referring to the HDCP Version. I don't see it mentioned but I would assume from the specs that it is v1.4 since I believe v2.2 requires HDMI 2.0 which is capable of higher Bbps than the 3Gbps listed with this device. If I have one 1080p and one 4K hooked up to this with a 4K source. (I understand that the 4K source will display 1080p on both displays at the same time.) Would the 4K TV receive 4K resolution if the 1080p TV is turned off? BEST ANSWER: Thank you for your question. With the 1080p display powered off, it should have no problem displaying 4K with the EDID swtiches set to AUTO. You can also set the EDID switches to their 4K setting to ensure that it will output the 4K signal. Can i have one HDMI in from my laptop and one from roku and o/p to my projector (for the video) and soundbar (for the audio).. I should be able to choose b/n my roku and laptop and the o/p should always be on both projector and soundbar (for audio)? BEST ANSWER: That is correct just make sure the devices a/o programming is compatible with the sound bar or change it until you hear sound . Will this device allow you to choose a single input and send it out to both outputs at the same time? Looking for the ability to choose between computers at my desk and have the desktop spread across both monitors as one big desktop. Or if anyone has any suggestions. i'm open. BEST ANSWER: No, it will give you the same signal on both machines. 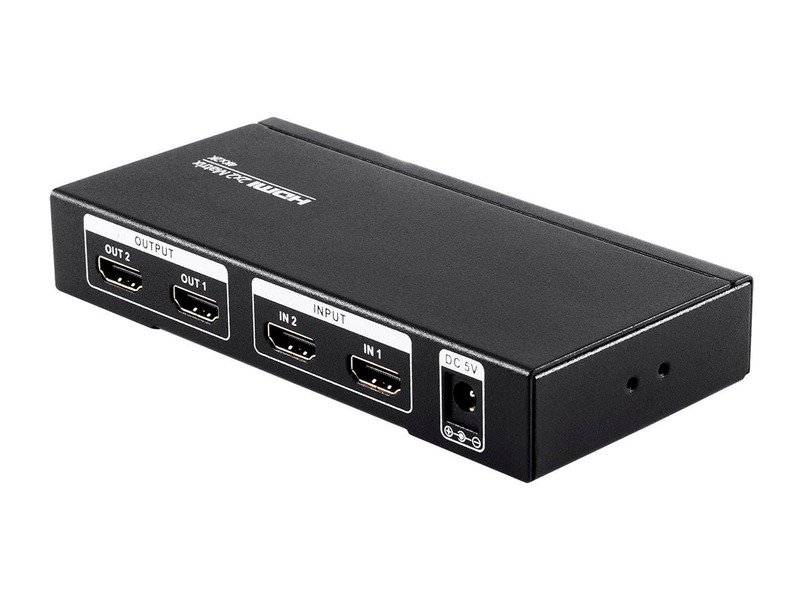 Most computers, if you have two video outs ( DVI, HDMI, SVGA ), you can get an inexpentive converter ( depending on imputs to your monitors) to have a desktop that spreads across both monitors. Does anyone know if this also supports HDR? If I have two types of monitors which can both receive 1080P signals, but one input is a 4:3 signal from a computer and the other input is an EDID forced 16:9 1080P signal, will the switcher follow the resolution of the input signal or try to force the input signal into a 16:9 signal? Does this switch support HDR? Ordering was easy, it was a great price and arrived in just a few days. Hooked it up and it works well for what we need. We used this switch to connect 2 TVs to PC and TV Box. 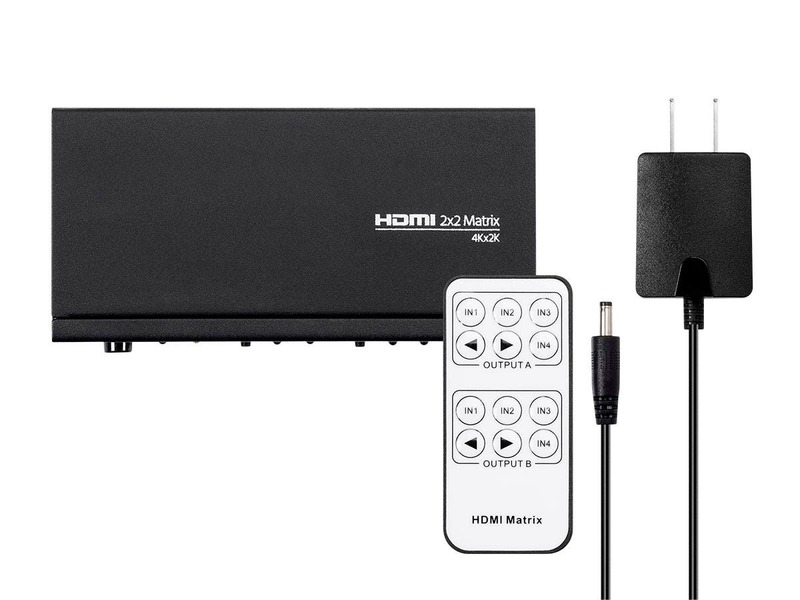 Easy to switch with small remote control between the inputs and outputs as you wish. 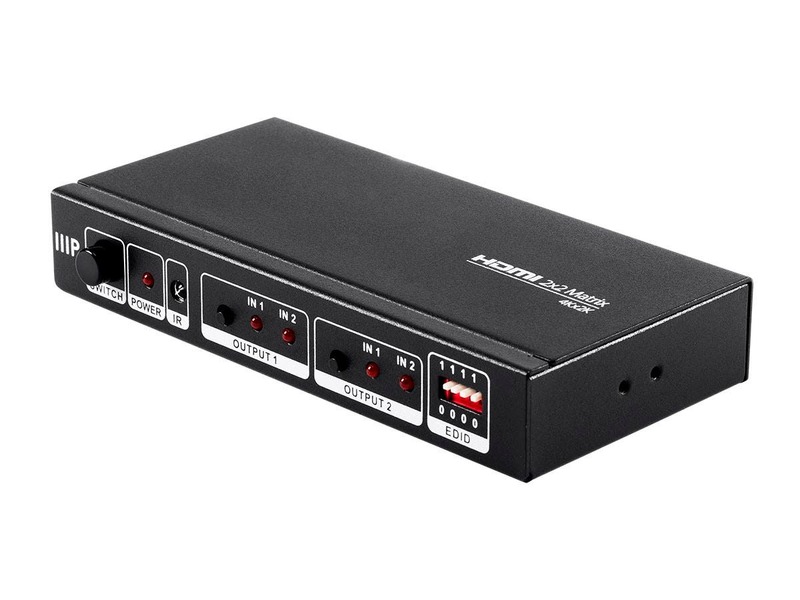 I bought this product so I could run audio from my STB and Apple TV through my Oppo UDP 205’s HDMI input to take advantage of the Oppo’s superior DAC’s. My Marantz AVR and Samsung 4K TB are also part of that HT configuration. Somewhere along the way, there were HDMI handshake issues resulting in my having to manually select the TV’s AVR input each time I turned on the system. In the end, it just wasn’t worth the trouble. Works exactly like it should. Easy to setup. Picture quality shows no loss of color or resolution. The box functions 100%. The remote takes some getting used to. The way it's organized is weird, but once you figure it out it makes sense, even though I find myself flipping through the source/display options after having it for a few weeks. Also, the remote needs direct line of sight to the unit. It worked great. I connected it to a 60ft HDMI cable to provide signal to bedroom TV without Spectrum $13/mo box. It paid for itself in 3 months. Great deal. Great product. It is doing the job, might be a bit more than I need, but hope it lasts longer than the last model I had. If you don't hear from me it must be alright yet. Nice compact and well cased design. Works well. Instructions for use are a bit awkward reading and from the setting of the DIP switches they appear to be opposite (to me at least) what the instructions read them to be in. Works very well though once the remote is figured out. Can group 2 different signals in to 2 separate outputs or 1 to 2 and I think the other way too. I've used this matrix with my Xbox to allow for switching between small and large screens, and my desktop to extend my workspace to my TV for presentation work. It works seamlessly and the remote simplifies operation. Does a good job but it does have some lag when switching and it acts a little crazy when one of the TV's is turned off , but nothing that is a big deal . Overall it does the job that I needed it for but not perfect so only 4 stars .